Long summers, humid days with the magnolia trees scenting the air, wintering in jeans and t-shirts without shivering from the cold, cheering on the Bulldogs at Mississippi State. There are lots of great reasons to study in Mississippi! One of those reasons is the relatively low cost of living, as compared to other states. That said, college and university can be expensive, but there are plenty of scholarships available to students wishing to study in Mississippi. Scholarships and grants can help offset the cost of tuition, books, supplies and accommodation in Mississippi. Some of the programs listed below are local scholarships open only to residents of Mississippi; others are national programs open to all students across America. There are also scholarships specific to women and minorities. These scholarships are open only to residents of the state of Mississippi or those who wish to study in Mississippi. Mississippi State University Competitive Scholarships include a Distinguished Scholarship open to freshmen of up to $34,000 ($8,500 over four years) plus on-campus housing. Applicants must have a high school GPA of 3.5 or above and SAT scores of over 1280. Other scholarships are available to business students, engineering students and post graduate students. The Mississippi Press Association Education Foundation offers two scholarships of $500 per semester, up to $4,000 to complete their B.S. to journalism students in the state of Mississippi. HELP – Higher Education Legislative Plan is open to residents of Mississippi with a GPA of 2.5 or above and who demonstrate financial need. Successful applicants are granted full tuition and fees for attendance at a recognized public institution for up to 10 semesters. The Nursing Education Loan/Scholarship (NELB) is open to legal residents of Mississippi looking to pursue a career in nursing. The NELB awards up to $4,000 per academic year to successful applicants admitted to an eligible accredited School of Nursing. Award recipients must maintain a GPA of 2.5 or higher for each semester/trimester they receive award money. A service obligation equal to one year of teachin applies to the award. 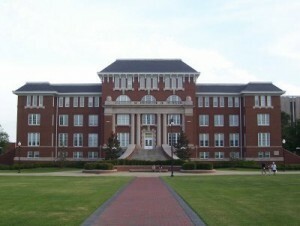 The University of Southern Mississippi in Hattiesburg has several admissions based and merit based scholarship programs that range from partial to full annual tuition for freshmen. More information about each of these scholarships can be found on the USM financial aid page. National scholarship programs are open to students in any state, and may be used by students wishing to enroll in post-secondary education in the state of Mississippi. The Federal Pell Grant Program is a national scholarship program open to residents of the United States. The Pell program is need-based for low-income students wishing to obtain higher education. Best Buy, the electronics retailer, offers 1,000 national scholarships of $1,000 every year. This is a national program open to all residents of the United States and Puerto Rico. Students in grades 9-12 with work or community volunteer involvement who plan to attend post-secondary academic or vocational schools are eligible. The McKelvey Scholarship is for students who have the distinction of being the first in their families to pursue post-secondary education. The McKelvey Foundation awards $12,000 to any qualified student enrolling in a four year college program in their home state. The Harry S. Truman Scholarship Foundation provides scholarships for students looking to pursue careers in the public sector; for example, in social work, public policy, international affairs, public health or education. The Harry S. Truman Scholarship is a national program open to all citizens of the United States and Puerto Rico. Historically under-represented in post-secondary education, women and minorities have special scholarships designed to encourage their attendance in colleges, universities and vocational schools across the USA. This is a snapshot of some of the thousands of scholarships available to women and minorities in America. The Xerox Technical Minority Scholarship Program assists minority students wishing to pursue careers in technology. U.S. citizens (or visa holders) with a GPA of 3.0 or above and enrolled in any of the following programs at an accredited post-secondary institution are eligible: Chemistry, Information Management, Computing &amp; Software Systems, Material Science, Printing Management Science, Laser Optics, Physics, Engineering (Chemical, Computer, Electrical, Imaging, Manufacturing, Mechanical, Optical, or Software). This is a national program with awards of $1,000 to $10,000. The Google Anita Borg Memorial Scholarship is a $10,000 award for women studying technology. Applicants must have a minimum 3.5 GPA (on a scale of 4.0) and maintain that high GPA while enrolled in a computer science, computer engineering or other closely related program. The Google Anita Borg Memorial Scholarship is an international scholarship program. The Miss Black USA Scholarship Pageant provides scholarships to black American women with both brains and beauty. The pageant is a social platform for the winner to promote awareness about health and education within the African-American community. Some scholarships are employer-based. If you or a family member work for a specific company, you may be eligible for tuition assistance or scholarship funds. McDonald’s offers a scholarship program for their employees. Every year McDonald’s grants a $2,500 scholarship to a student employee in each state based on academic achievement. Three outstanding scholar/employees are granted awards of $5,000. Army ROTC Scholarships – The Reserve Officers Training Corps provides full tuition scholarships and living expenses. Learn more at GoArmy.com. You are encouraged to apply for as many scholarships as you possibly can. Competition for scholarship dollars is intense, and you may not succeed in receiving your first choice award. However, with the plethora of scholarship opportunities out there, there is plenty of money to go around. If you are a woman or a minority, apply to both the “regular” scholarships as well as any programs that may be specific to you. While all applications will be a little different, the basis of any application is the essay portion. Using word processing software such as Microsoft Word, prepare a basic application essay that outlines your accomplishments and goals. Use this basic essay as your backbone document, and then tweak it to suit each individual application. For example, some scholarships may place higher importance on community involvement, while others will be more academic in nature. A good basic essay will see you through, while you just cut and paste, drag and drop, and add bits of original information to each one. Keep a spreadsheet with information on all the applications you’ve made. List the name of the scholarship or grant, the deadline, the approximate amount of the award and the date you applied. If you use both MS Word and MS Excel, you can actually attach your essay into a cell on the spreadsheet for quick reference. Organization is key! Don’t wait for the last minute. The deadline may be months away, but there are so many documents to pull together that time will simply fly by. Make your application at the earliest possible date. Keep your chin up. Life is full of rejection, and the scholarship application process is a great way to learn about it. Applying for scholarships is a lot like applying for jobs: The more applications you send out, the more likely that someone will bite. With a little preparation and a lot of organization, you will prove to potential programs that you are the kind of quality student they want to back. Good luck, and enjoy your time in beautiful Mississippi!